Known as a 'must-ride' in the Lake Tahoe area, the Flume Trail in Tahoe has a few variations, providing sweeping panoramas of Lake Tahoe and thrills for intermediate and advanced riders alike. After the initial climb, enjoy a picnic lunch of the shores of Lake Marlette. Blaze down the Flume Trail's singletrack, while enjoying the views of Lake Tahoe. To avoid an extra 9 miles on a narrow, uphill road, bikers cab hire local shuttles meet at the end of the Flume Trail. A popular destination for mountain biking, the Lake Tahoe area offers trails for all ability levels. Known as a 'must-ride', the Flume Trail in Tahoe has a few variations, providing sweeping panoramas of Lake Tahoe and thrills for intermediate and advanced riders alike. Beginning at Spooner Lake and ending at Highway 28, the Tahoe Flume Trail traverses 1600 feet above the east shore of lake Tahoe. Whether driving or riding your bike, begin at the Spooner Lake day use area in the Lake Tahoe Nevada State Park. From this parking area, look for signs to the Flume Trail via the North Canyon Road. There are several variations of this trail, the most popular being the one-way Spooner-Marlette-Flume-Tunnel Creek ride. Approximately 13 miles long, this trail climbs 1200 feet, with a total descent of 1800 feet. 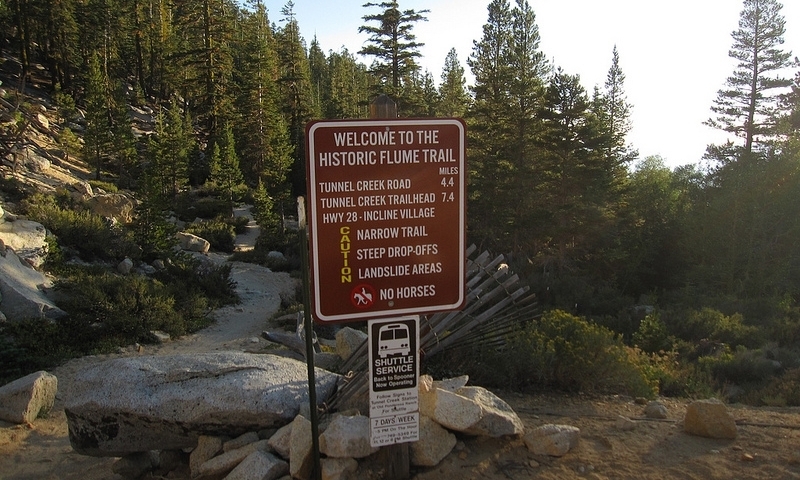 Many people either shuttle their own car or hire a shuttle to avoid the 9 mile uphill road ride back to beginning the Tahoe Flume trail head. Begin at Spooner Summit State Park with a challenging steep climb via the North Canyon Road, approximately 5 miles. This climb to Marlette Lake meanders through aspen groves and stream crossings. Upon reaching Marlette, turn left and continue north along the western shore. Follow this trail until it crosses the stream flowing out of Marlette Lake. This is the start of the Flume Trail proper! As the Flume Trail singletrack heads north along the mountains, the Lake Tahoe Flume Trail narrows and becomes exposed in several places. Several rock slides also need to be negotiated. As the trail heads east, there will be an intersection with Tunnel Creek Rd. Turn left onto this steep, sandy road and continue down to Highway 28. After the initial climb, the peaceful and pristine Marlette Lake is a popular place to stop for a snack or picnic lunch. The fall colors are particularly spectacular. The 4.5 miles of single track after Marlette Lake is the most scenic section of the whole ride. As you cruise down, be sure to stop along the way for fabulous views of Lake Tahoe and the surrounding mountains. The Twin Lakes and Franktown variations are both rated as advanced. The Twin Lake variation add 9 miles and 1000 feet of climbing, while the Franktown variation is a total of 25 miles and gains more than 2500 feet. Local bike shops can provide trail maps and detailed information.